I am hoping to get this update finished before the next stage of our winter sojourn – haul-out and getting ready for spring departures! My sister Jessica and husband Mark arrive for a visit (land based) on Saturday 27th. 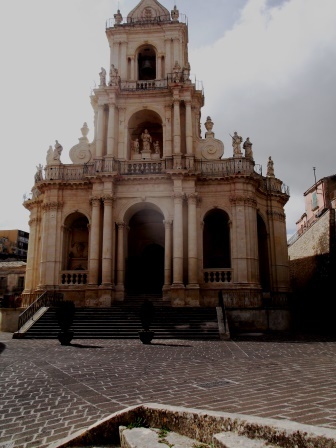 We will take advantage of their chauffeur service and visit one or two places that we have just not had the time or energy to go to since we arrived in Licata. So all that will be in the next episode! In my last post, I was describing our various electronic and communications problems. Brian’s new tablet (Samsung) arrived – a larger 9.5” one to replace his previous 8” one. However after he had laboriously set it up with his name and ID etc, he looked for the sim card slot only to find there wasn’t one! I had ordered the wrong model. Oh No. I nervously went back onto the Amazon (Italian) site and managed to negotiate my way through the returns process – which was surprisingly straightforward. We set the tablet back to factory settings, packed it up in its box and printed off the return papers. The instructions were to take the box and papers separately to the post office, which I did. I fortunately chose a day when there was no queue (having heard of people having to wait 2 hours) and the young clerk put the return papers through a bar code machine, packed them into one of those sticky wallets, printed out a receipt for me, pinned to a copy of the returns document, and said that was it – nothing to pay! By the time I had returned to the boat, an email was waiting for me to say that Amazon accepted the return, and was refunding the purchase price less a minimal charge for postage. What service – I was (and still am) totally amazed! How have they managed to link their systems to the Italian postal service? It defies belief. Anyway, I had of course ordered the correct model of tablet by then, and it arrived and was deemed acceptable! I have to say that the larger screen is much better. Brian has since spent some time getting it set up and learning the new facilities etc. The Vodafone sim card was moved to the tablet and tethering set up, so the poor mangled mifi unit could be retired back to its box! 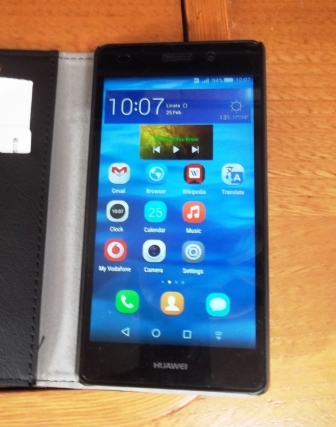 My Christmas present was a new phone – a Huawei P8 lite smart phone. Wow. The old Nokia I used for local calls was retired, and the new one played with. I had ordered Bluetooth headphones (earplug type ones each and a muff type set) and another SD card which I loaded with a few Gb of music. So now I can listen to my own selection of music without bothering anyone else! However I have since found that it is a bit antisocial so I haven’t used the facility as much as I thought I might. I also ordered a Bluetooth mouse for the new computer – and only tried to set that up this week – with rather patchy success and it has since stopped working again. Windows 10 is a mystery and a pain in the neck. 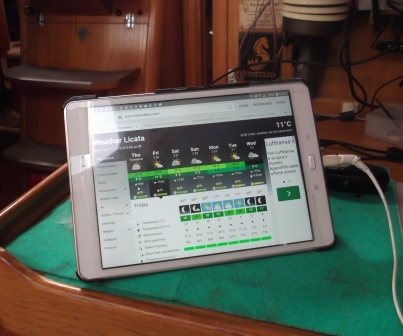 The GPS and AIS link to our navigation software still remains to be fixed – a job for next week perhaps. I went to the Vodafone shop and after some difficulty managed to get a package for both calls and internet. Having advertised my new number, I received a call from Matt, the young Australian engineer who lives in Licata and who is helping us source boat stuff and helped arrange our lift out with the local yard. But I couldn’t work out how to answer the call! I phoned back – he then explained that I should have swiped the centre circle to the green accept icon! How daft. I since learned that other friends have had similar problems – old fogies us. Matt had also previously fixed a problem with our sim card that seemed to have stopped working. He solved it by removing the security code from the card – I didn’t know you could do that either! Meantime I have had fun learning how to use the new phone and tidying it up, getting rid of some of the junk that was pre-installed and working out how to prevent it using up all my data allowance with software updates. No I don’t want to play children’s games (or any games) on it! Not least, I find it takes better photos than my Fuji snapshot camera and I can put them in emails quite easily (although I imagine they are not compressed when I do that – another thing to find out). It is all fun and games. That is enough of our computer, tablet and phone saga. In mid-January I went on a walk organised by the walk/food group – this time opting to go for the whole event. Quite a few from the marina went along. We were ferried up to the hospital carpark, where a huge number of people congregated – there must have been about 60 altogether. Italian scheduling predominated – after a draughty and cold half hour hanging around in the carpark, we walked about 100 metres down the road, to have a very long explanation about the remains of the old aqueduct in the road – in Italian. Several of us walked across the road to stand in the sunshine while this went on. The English version took about 10th of the time – but we couldn’t hear it anyway! After that we had a more energetic walk along footpaths round the back of the hill on which Licata is built, examining the prehistoric caves (tombs probably) that dot the hillside. From there we hiked up into a modern gated villa estate where we were served fresh juice – but with two people pouring drinks for 60 it took a long time and then there was a lot of standing around and chatting. After that we hiked up fields to the top of the hill and the Stagnone (see previous blog) then back to the hospital to meet people who were waiting there to be shown where to go for the advertised lunch – which then turned out to be at the place where we had had the juice break! So badly organised – we could just have walked back from the Stagnone instead of having to find vehicles at the hospital to take us back for lunch. However lunch was exceptionally good. A mixture of finger food (pizza of course) but also roast vegetables, then bowls of chickpea soup to warm us up (it was very cold and windy). By the end of lunch I agreed with Ina and Geert that enough was enough, so we cadged a lift back to the marina from Nadine, who has a yacht but lives in an apartment in the next bay with her young son Daniel and husband David and has a large people carrier. Brian, sensibly, had eschewed the walk and continued work on the electronics panel, with a lot of fiddling (sorry, “calibration”) to get the new meters to show the right results. That took some time, but finally all was completed about a week ago. It looks wonderful and even has labels that I can understand! Note USB power outlets and the 9V battery charger – clever! 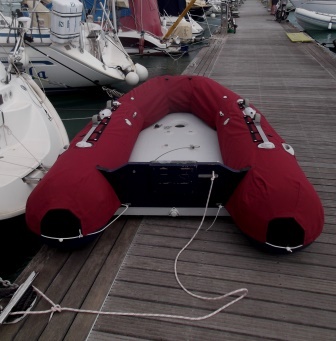 About the 20th January I started work on our new dinghy cover. First of all we had to unpack the dinghy and pump it up of course! When I wasn’t measuring it up and doing “fittings”, when it had to be on the pontoon, we plunked it in the water next to the boat. Fortunately the boats are widely enough spaced that it wasn’t a problem. In other marinas that might have been difficult. Anyway, that made more space at the front of the boat, making hanging the washing out a bit easier. Starting with an old duvet cover (which I must replace sometime soon) I made a template. Then I hauled our roll of waterproof fabric (like Sunbrella but a different make), up to the yacht club room. It was great to have a huge space to roll out the fabric and place the template on it, marking an outline with chalk. Then I crossed my fingers and cut and sewed! Along with the fabric I had ordered a reel of UV resistant thread – the smallest quantity was 3,000 metres! Of course the reel was far too big to fit on my sewing machine. Thank goodness for those 6 new bobbins Gill had bought for me in the UK a couple of years ago! Each bobbin doesn’t hold much, so I have wound thread onto them many times in the course of this project. Also the thread is very springy and shiny, so the machine tensioning had to be tweaked a bit. However once all that was set up, I just had to get on with it and put it all together! One or two problems arose so I had to redesign the part at the front, but generally it went OK. It was really hard work trying to sew strengthening bits around the holes for the various knobs and straps. I had four tables set out to support the stiff fabric as I twisted it from side to side to get around all the circles and squares. My sewing machine is a basic fixed arm one, so getting the fabric through the fairly small aperture was not the easiest task – despite the cool temperature in the room I was sweating a few times! Finally this week it was done, we got the drawstring into the slot to tighten the bottom around the outside of the dinghy, courtesy of a very long piece of stiff wire Brian had kept for that very purpose! Then I tried to put the press studs on that I had bought to hold the sides together under the straps – in vain. But the marina chandler came to my rescue and sent for a man who could do it – at a price of course! But it all looks very nice now as he has used better press studs than I had found. Not quite as sleek as I might have wished but it will do the job of keeping the sun off the tubes. People who have watched my progress with interest have been very complimentary, even bringing us a very small bottle of champagne to break over the bows when we launch it! This task was interrupted for a couple of weeks as we headed off on our bird watching trip. I had made a reservation for this, after being contacted by Andrea Corso who is a professional birder based in Syracuse. He had responded to an initial enquiry about general birdwatching in Sicily with information about his services, which were a bit out of our league for just the two of us. 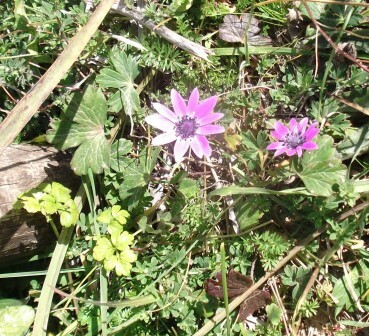 However, last November he forwarded a brochure about one week trips around Etna and Catania, either January or February. I booked on the February one, (4th to 10th) at what seemed to be a rather exorbitant price, but as a bit of a treat. We set off on 4th to meet up with the rest of the group (all Italians) at Catania airport. The marina guys gave us a lift to the bus station and we were invited to take a minibus instead for the same price. This was much quicker so we had almost 3 hours to kill before the appointed meeting time. We ensconced ourselves in a café in a warm upstairs area but after an hour or so I went on a tour (to find the toilets) and check out where we were supposed to meet. 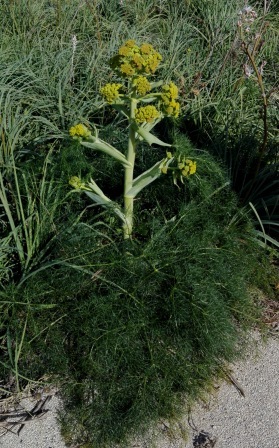 I saw a group of people looking very outdoorsy – green anoraks and suitcases – and a young man leapt to his feet saying “is that Rose?” I was surprised that this might be Andrea, but so it turned out to be. They had all arrived a bit early and so I gathered up Brian and our bags and we introduced ourselves to the group of 9 other people. I caught two names – Dante and Claudia. The other names were never clear but I did manage another three before the end of the trip (Remo, Giancarlo and Mauro). Dante, Claudia and Mauro, as well as Andrea and Miki were all younger than us. The rest were the same age or older – three other couples and three solo men altogether. We piled into a people carrier (9 of us) and a smaller van (4 people) making 13 in all. The others (apart from Andrea) had all flown in from various parts of Italy – Milan, Rome, northern Italy etc. They had all had very bumpy flights (it was cold, windy and wet by the time we had arrived) with several attempts at landing before eventually reaching terra firma. 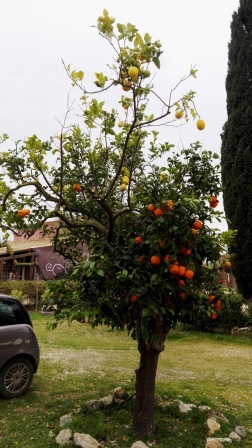 They oohed and aahed at the orange orchards along the roads – I had forgotten that these wouldn’t be common north of the places we overwinter! 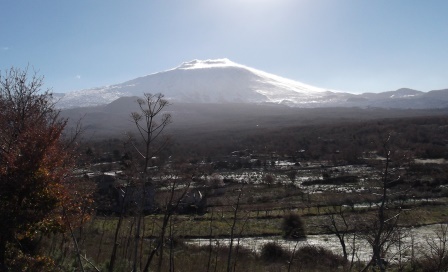 We headed up past Syracuse to the northern slopes of Etna. The roads became small and winding, and it started to snow heavily! 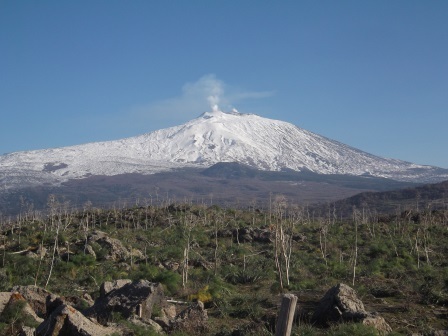 Eventually we reached the hotel that would be our base for the next 3 nights – Etna Quota Mille. It was a converted oil press (that room being the restaurant) and 6 guest rooms all with exterior facing doors in an adjacent converted barn. The rooms were lovely and warm and we all settled in comfortably. As there were only 6 rooms for the group, Andrea and his co-guide Michele (Miki) had had to book rooms in the village 3 km away. We had about a half hour before dinner, then met up in the restaurant. We were introduced to Remo who spoke perfect English. It turned out he had been born in Glasgow (of Italian parents) but had returned to Italy at some stage. He became our emergency translator when we needed confirmation of what was going on! Most of the others spoke a bit of English so we were not too ostracised. Dinner – the tables were set with flasks of red wine – refilled as required – and then the anti-pasti started to arrive. Dish after dish of delicious Sicilian specialities. Cheeses, vegetable mixes, prosciutto, snails, chickpea and bean casseroles, deep fried balls of various things, spinach, and tripe – the list went on and I can’t remember all of it. We all started worrying that we would then be presented with another two or three courses – but fortunately not. A second course of ravioli that night, chickpea soup the next then steaks or mixed grill were quite sufficient. Brian and I splurged on the snails, and I on the tripe – no-one else seemed keen! Then to finish, a nice desert, coffee if requested, and a small tot of grappa. Lovely. 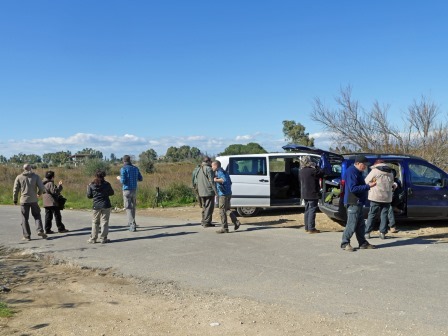 The next day dawned bright but very cold and windy, so Andrea took us back down to the plains around Catania where we toured various sites and saw lots of birds. As we piled into the vans, we realised that the other participants were Serious Bird Watchers! All had long distance scopes, cameras with huge lenses etc. We were outclassed by several degrees. The second day most of us braved a dawn start to try to find rock partridges unique to the northern slopes of Etna – about 15 minutes’ drive from the hotel. 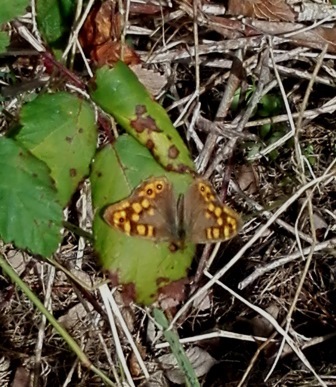 We looked for ages, then set off among the rocky meadows, clambering around remains of old walls and huts, to try to flush them out – without success! We sheltered from the wind…..
After that we headed back for breakfast (not inspiring) and then up to the snowy car park for the ski resort on Etna. 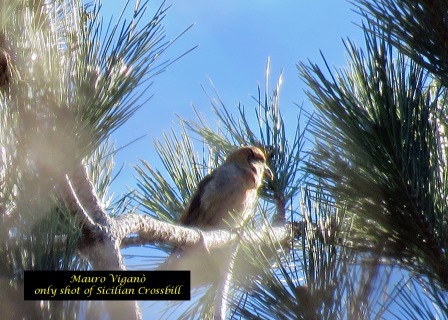 We were hunting for the crossbill, which eventually Andrea found at the top of a pine tree as we returned to the lower slopes for lunch! Wow.Mauro managed this picture into the sun. And I identified a chaffinch. And saw a short toed tree creeper (apparently). We visited Randazzo – a town built of black lava rock with smart churches and a view over a gorge where we saw crag martins circling. After that we visited a gorge where Andrea knew a couple of lanner falcons were nesting. 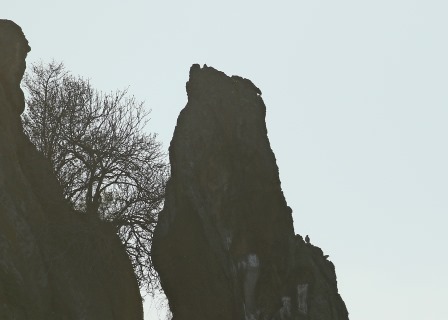 One was sat on a crag below a ruined castle eating something, then joined by its mate also with her dinner in claw – wonderful (through the powerful scopes!). The pictures wouldn’t turn out well as the sun was setting behind the nesting site. On the third day we packed up our bags and piled them into the vans (with great difficulty) and then headed off to Syracuse, stopping off for bird watching of course, then had a tour of Ortygia (which we had seen before). We were pleased to point out where we parked the boat when visiting the town! Andrea took us round the best parts of the old town, pointing out the trademark gecko that the premier architect hid somewhere on each building he designed and built! We had lunch in one of the squares, then continued south, finally arriving at the B&B “The Lemon Gard’n” (sic) which was a fine eclectic mix of rooms full of objets trouvés. 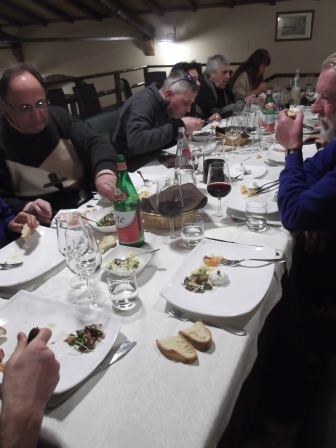 Dinner was totally different than the hotel, but very good and more in keeping with the traditional many course Italian style – although again it was kept within the realms of possibility! For the first two evenings, part of our dinner was accompanied by the son of the landlady and then Francesca herself playing excellently performed piano sonatas. Weird but wonderful. 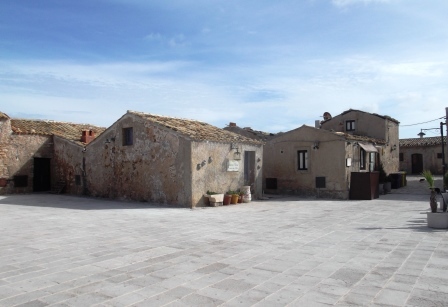 The fourth day saw us touring various salt marshes and lagoons as well as the sea shore, to find the elusive Audouin’s gull and Richard’s pipits, with lunch in the lovely square in Marzamemi – again pointing out where we have parked the boat in previous years! The final day we went up into the hills around Palazzolo Acreide and toured the fantastic canyons and footpaths down to the bottom where rushing streams poured into quiet pools. A huge Neolithic tomb site is there with thousands of tombs dug into the cliffs – amazing. Not many birds that day! Every day of the tour, Andrea found back street bakeries and cafés which sold amazing fresh arancini (deep fried breaded pyramids containing rice, cheese, meat and other fillings) and sweet cannoli (like brandy snaps with pistachio flavoured ricotta, or plain) for our picnic lunches. Andrea got very excited about the pistachio which is a local and famous product. 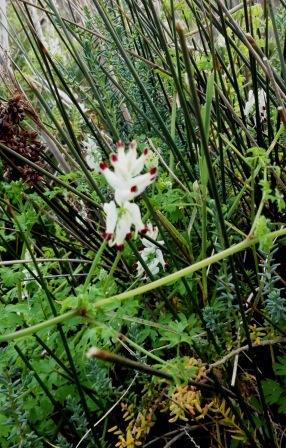 We passed through bare orchards perched on jumbled rocks on the western slopes of Etna. Everything – dinners, lunches, drinks etc – was included in the price of the trip so we didn’t have to pay for anything at all – making the price of the trip a bargain. 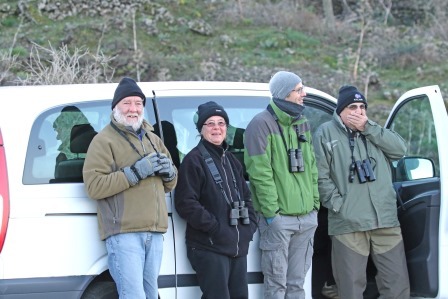 Andrea is considered the pre-eminent bird watcher in Italy and it was a privilege to join one of his trips. He organises expeditions to all sorts of places, as well as publishing papers on birds and other things. 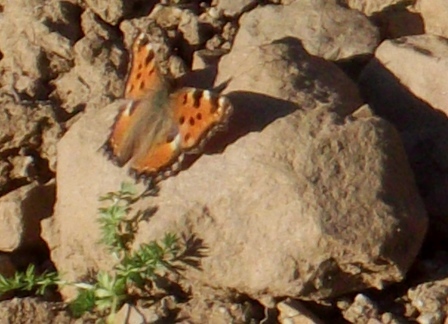 He makes a special study of dragonflies we found out but also knows all the local reptiles – he often lifted rocks in the fields to find toads and lizards. We returned, replete and happy. 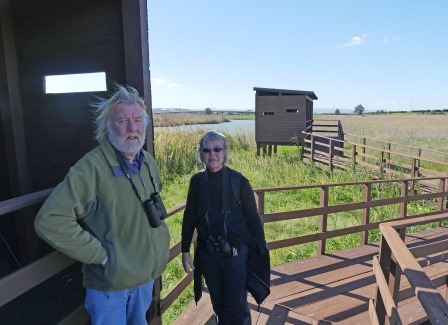 We had seen new birds for us – Booted Eagles, the crossbill, black necked grebes, gadwalls, ferruginous ducks, and also second looks at gannets, a couple of ospreys, hen harriers and marsh harriers and lots of smaller birds as well as identifying the different gulls – the list is long. 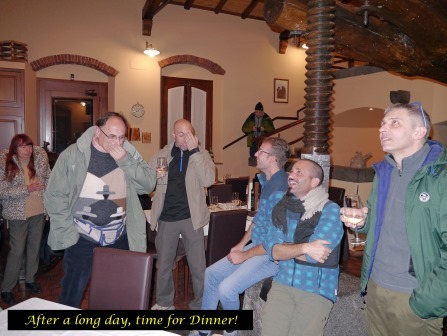 We soon learned the Italian word for buzzard – poiana! Alixora had been impatiently waiting for our return, and decided to break one of the floor board ring pulls, break the shower head in the bathroom basin and make the headlining in the port aft cabin fall off just to make sure we didn’t do it again! The next day we rested, then set back to work. I found that our absence, and the lack of ventilation had also encouraged some rather virulent mould to grow in our forward sleeping cabin, so that took a day to clear out and swab down. The interior of the boat needed a good clean – only half done I fear so far! The usual chores of washing, shopping and cooking continued. 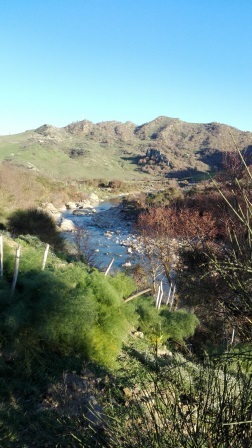 After a week of getting back into the swing of things and some heavy rain and wind, the sun returned. 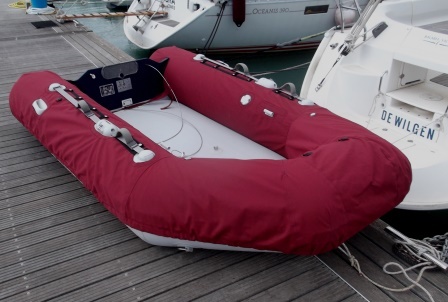 I continued with the dinghy cover sewing, finishing that, and a new “boot” cover for the mast end of the main sail as well as a new fender cover and a peg bag to replace the plastic bag we had used previously. I now find another fender cover that needs replacing and various other bits to repair. Brian spent a good day or two dismantling some of our door locks. A couple of years ago two of them broke the springs that operate the catches. We fudged one repair with a “found” spring and the other stayed broken so that went on a door that we leave open all the time. When we visited the boat show in Istanbul we found a company that supplied the locks made by the Italian company F.lli Razeto & Casareto – the same as on our boat. They gave us the contact name of the main salesman, Andrea Razeto – obviously still a family concern. Their website shows the history – fascinating. http://www.razetocasareto.com/?page_id=35&lang=en. I contacted them now we were in Italy and after a bit of toing and froing we got a pack of 20 (! Minimum order) springs delivered. Brian then fitted them and put all the door locks back into the appropriate places – cleaning them up as he went. Good job, well done. Another fun job that Brian undertook was to clean out some of the toilet pipes – it was getting very smelly and siphoning back into the pan. He dismantled and refitted the old Y valve that goes to the holding tank (we don’t use it in the harbour) and has started to design a new layout to reduce the pipework as we have since purchased a new one that should work better. He made a long distance sortie to the shopping centre at the far end of town that has a big DIY store, and amazingly found the exact replica of the shower head that broke off! Total amazement as we had bought the original fitting in Turkey. So we now have a replacement and also one spare – just in case. He has also reinforced the bottom of the transom on the dinghy with some plastic profile to prevent the fabric wearing through – another good job to get done. The pump that sends the cooling water through the engine has decided to start leaking too and it is only 3-4 years old. We had kept the old one, so Matt will refurbish that and then we can swap it over and get the newer one fixed too – always handy to have spares on hand! The Italian lessons continue – and a fellow Italian yachtie (Laura, married to an English chap) is now helping us with conversation at the café once a week for an hour or so which is very kind of her.